Avatar Neytiri fan art? Yes please! 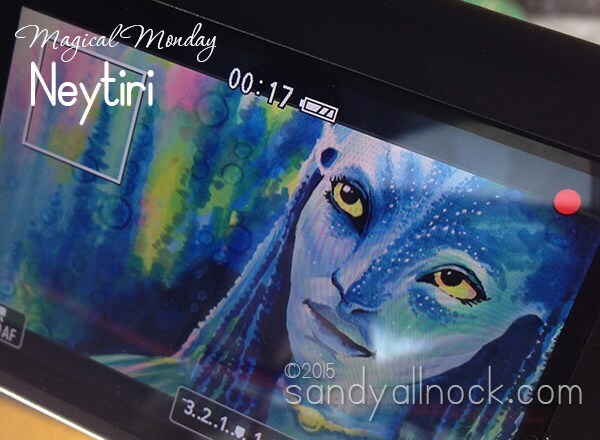 I’ve not been known to create Neytiri fan art or any other kind of movie piee, really – well maybe my Scrat portrait counts? 🙂 But if you have suggestions for something I should try, let me know in the comments. Maybe I’ll tackle some of your ideas. Real-time version available as a class! Video runtime is 32:43. Edits out only hunting for colors and refilling markers. Includes voiceover, but beware. 32 minutes of ANYONE talking is…well, a lot! IMPORTANT NOTE: I’m not going to be available to help you get into the class. So this is important: doublecheck your email address as you fill out your information. The receipt sent to that address will contain your link and password for class; I can’t tell you the number of times folks mistype their address and then email me that they never got the receipt. I won’t be able to get that for you until I return, so please make sure you check all your information carefully. Okay. Now that all that is out of the way: here’s the link…and the class is discounted until I return from Europe! For those who noted that I forgot to add pics of my backpack for the trip, those items have been added to the end of yesterday’s blog post. 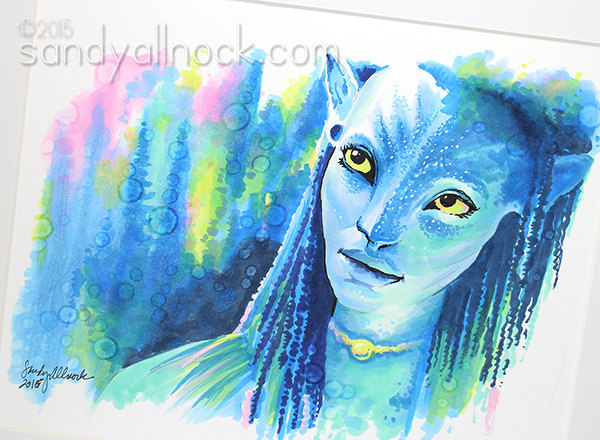 If you’ve created any Neytiri fan art, or if you’ve seen any cool drawings – drop me a link in the comments! Your talent truly has no limit. Wow. Just wow. I tell my husband that you’re the master of all things marker related! Gorgeous piece of art and beautiful colors! Is there anything that you Can’t do?!!! Wow! This is amazing. Thanks so much for inspiring me. So awesome, makes me want to see the show again! Your class link didn’t work. Have fun in London!! Awesome–you are so talented. Any of the characters from super hero movies would be great. Just stunning wow you really leave me in awe. Have a great trip. Neytiri looks absolutely stunning. I wish I could come up with a new way to say how much I appreciate your wonderful talent and the time you devote to sharing it with us. I concur with all of those that are in awe of your giving nature! Again, enjoy every minute of your trip. Safe travels, Sandy! This piece is beyond amazing. I did not watch this video, because I will never be able to draw like that. But I wanted to tell how beautiful that picture is and what an amazing artist you are! Beyond amazing! I sat mesmerized as I watched you create this masterpiece. Safe travels as you paint, eat, and drink your way through Europe. Have fun! Geez, everytime I think you couldn’t get any better, you do. Amazing…Enjoy your trip. Awesome!!! Have a fun trip!! Have a fantastic trip. I am in awe of your artistry. We’ll miss you while you are gone, even though I know you’re scheduling posts and are taking care of us. Have a great time! Omg Sandy, I love that movie and you captured her likeness to the tee! You are so uber talented, what a gift God gave you:) Europe, can I sneak in your suitcase, lol. I hope you take lots of pictures and get the chance to paint, I’m sure they’ll be magnificent!!! Enjoy every moment! The art work you have created on the female from Avatar is spectacular. I have followed you since my early days on TwoPeas and your growth in areas of art media has grown by leaps and bounds. You inspire so many. This new artist side of you, that you are showing us, is so beautiful. Thanks for sharing with us your expanded talents. Can’t wait to see your trip art. You are probably heading out the door as I post this, so first of all I am praying for safe travels for you. I’ve been following you for 4 years now & I just have to say that I am so glad that life has, I don’t want to say “slowed down” ’cause I know that’s not the case, so let’s just say “changed” enough to allow you to showcase and express more of your art & talent. This piece today is beautiful. Ma’m – may I just say – WOW. You da bomb! Exquisite rendering! If I wasn’t already a fan, I’d sure be one now!!! Wish I could get a poster! Oh hey – I was watching “Guardians of the Galaxy” with my grandson last night – and couldn’t help but notice that the CG work of the Rocky Raccoon character seemed a little coarse compared to your Scrat – just sayin! Sandy, unless I am missing something, the class button does not give me the option to purchase the class – it asks for the link so watch it.